The citizens of Paterson cannot afford a tax increase and neither can the Paterson Public Schools afford a $5M cut. Gov. Christie is breaking the law and we are playing into his hand. We have to unite and tell him to fund the formula. The Paterson City Council and School Board should be working together to demand the funding that is provided for under the law. The New Jersey School Funding Reform Act of 2008, the State’s school aid formula, ensures adequate and equitable school funding for each child on the basis of individual need, regardless of where that child lives. The formula has not been fully funded after 2009. Over the past 6 years, Paterson’s education budget has been underfunded by $173.8M. Continued underfunding of the New Jersey School Funding Reform Act of 2008 has resulted in cuts to vital educational programs and services in schools in Paterson and throughout the state. Even given the underfunding, the schools are making gains. We are beginning to see progress, our children are doing better but cutting back would be devastating to this progress. More and more is being demanded of our children and our schools, and all these demands bring an increased price tag. Flat funding has led to bare bones operations including a bare minimum in teaching staff. • Kids have seen their class sizes increase because teachers had to be laid off. • Classes are under resourced because they can’t afford the necessary supplies. • There isn’t enough technology to teach and test at the same time so access is restricted for 3 months for most students. • 75 administrative positions have been cut over the past 5 years. • We are losing talented personnel to other districts because we can’t offer a competitive salary. • Kids lost music and arts and language classes as well as sports teams and instructional aides. • Essential programming has been cut. • Kids drop out because of lack of support. What message are we sending to our children when we keep taking away needed services? What future do we expect for Paterson if the majority of our students are under educated and can’t earn living wages or make any civic contributions? My message is simple. Fighting each other is fighting the wrong battle. Sending an auditor in to slice and dice programs will only harm our children. Please tell your legislators to adhere to the law and fund the School Funding Reform Act. Demand that the Department of Education allocate funding based on the SFRA calculations. 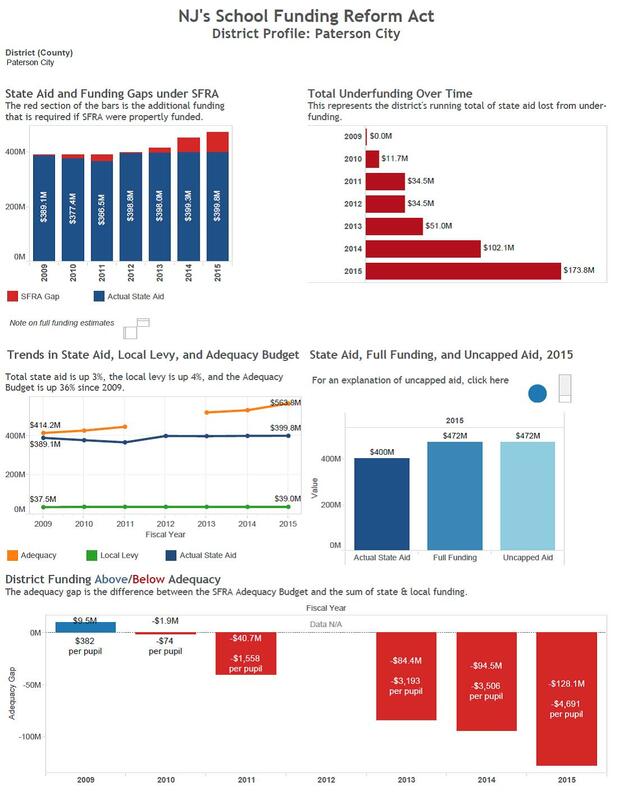 The NJ Legislature passed the School Funding Reform Act into law in 2008 and it was upheld by the NJ Supreme Court with a specific directive that it should be fully funded for the poorest districts. The State shouldn’t be allowed to thumb its nose at the law while forcing us to raise local taxes. If the State budget passes as presented, Paterson Public Schools will be under adequacy by $128M. Please do the right thing and take a stand for Paterson children.